Michelle Allen, the Florida organizer for Food & Water Watch, talks to the group outside the Old Lee County Courthouse. A dozen concerned community members gathered outside the Old Lee County Courthouse. They stood beside a mockup of an oil rig made of painted plastic tubes. Shiny black garbage bags represented oil, and they appeared to spill out, dumping mock oil onto the pink plastic lawn flamingos. 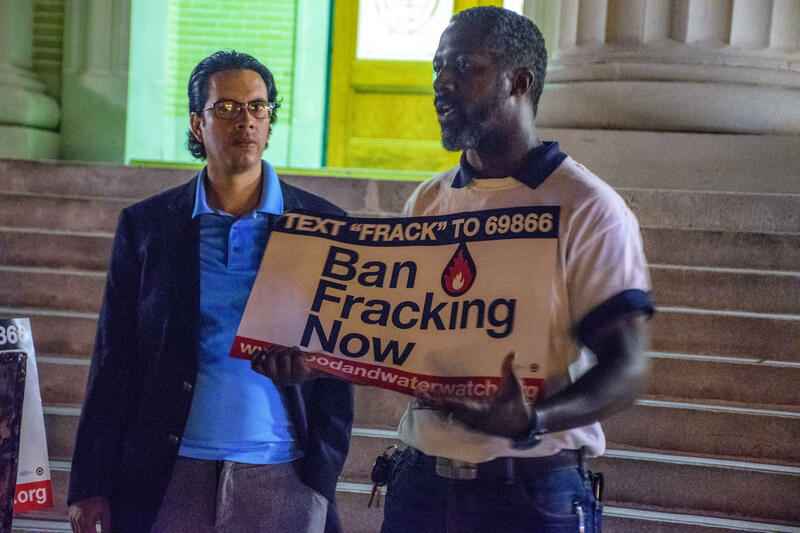 “Today, we are out here urging our legislators to support, in the 2018 legislative session, the fracking ban legislation that will be moving through, which is Senate Bill 462 and House Bill 237,” McGregor said. That house bill was co-introduced by state Rep. Heather Fitzenhagen, whose 78th district covers the city of Fort Myers. 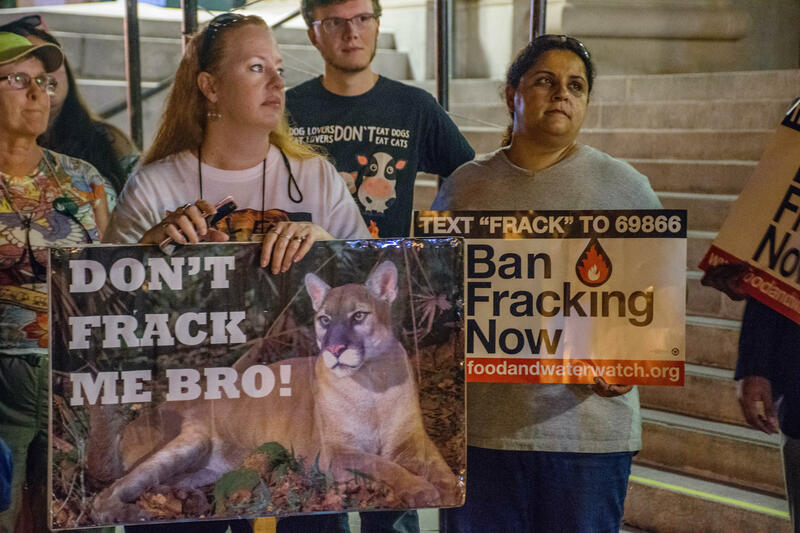 She joined her constituents outside the courthouse with a “ban fracking now” sign. The Republican representative has become part of a bipartisan effort to ban advanced well stimulation treatments – in other words, both hydraulic and acid fracking – across the state. But, for crowd members like McGregor, this fight is not a new one. 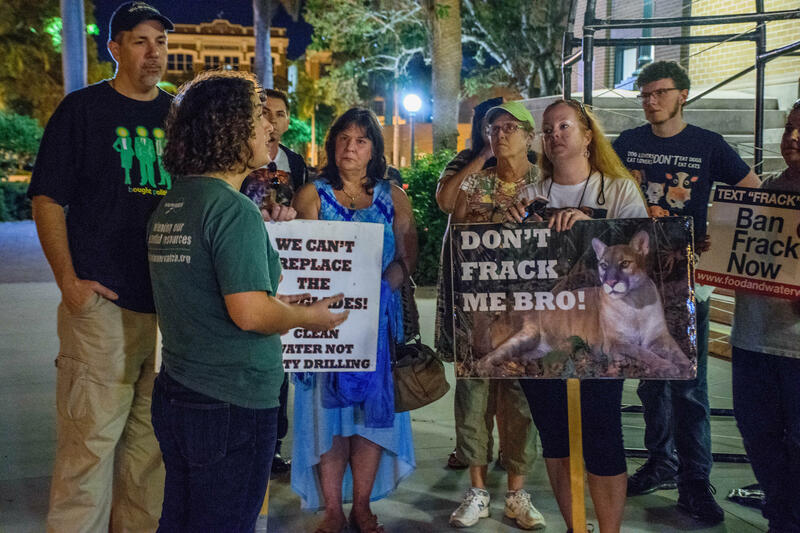 Michelle Allen is the Florida organizer with Food & Water Watch, the national non-governmental organization behind the mock oil rig spill. The authors of a study published earlier this year – in the journal "Environmental Science & Technology" –would certainly agree. Researchers identified nearly 7,000 spills over the last decade between four states that allow fracking. 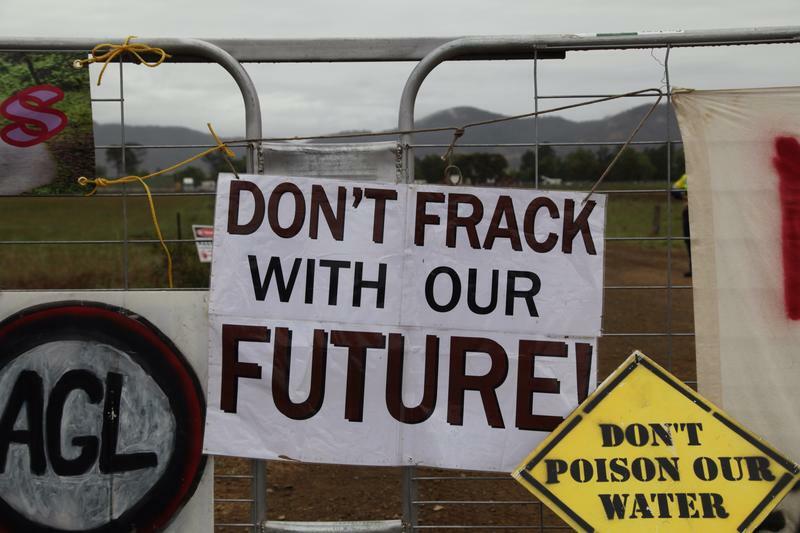 The sample size included nearly 32,000 wells, meaning more than 20 percent of the sites practicing fracking had a spill in the last 10 years. Fitzenhagen says the health and environmental risks of fracking are just not worth it, especially in the state’s tourism-based economy. “Why people move here could be obliterated by a few simple mistakes,” Fitzenhagen said. Clifford Mitchem is an energy advisor with Clean Renewable Energy Worldwide, or CREW. He says why people come to the Sunshine State is right there in its name – the sunshine – which isn’t going anywhere, fracking or not. He says the simple solution to Florida’s energy issues can be found by just looking up. Clifford Mitchem, holding a Ban Fracking Now sign, addresses the crowd. Mitchem says the problem is that many in the area are just unaware – of not only the solution, but also the problem itself. If they knew, he said, the entire city of Fort Myers would’ve met on the old courthouse steps. Bills banning fracking are once again on the House and Senate agendas for the upcoming legislative session in Tallahassee. In light of that, the Conservancy of Southwest Florida is hosting a leading researcher on unconventional oil and gas extraction, Dr. Anthony Ingraffea, this week.